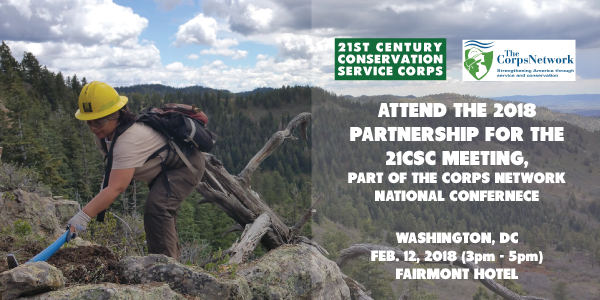 Every year, the Partnership for the 21CSC (P-21CSC) holds a meeting in conjunction with The Corps Network National Conference (The Corps Network is a Co-Chair organization of the P-21CSC). During this meeting, we discuss Corps and land management agency partnerships; review accomplishments from the past year; hear inspiring speakers; and honor the 21CSC Champions of the Year, as well as the 21CSC Corpsmember of the Year and Project of the Year. We invite you to attend the 2018 P-21CSC meeting and The Corps Network 2018 National Conference. 3:00 p.m. – 5:00 pm. This entry was posted in Uncategorized on January 5, 2018 by Hannah.